Fold the card in half lengthways. Cut long lines in the card about 1 inch apart and about 1 inch from the edge of the card. 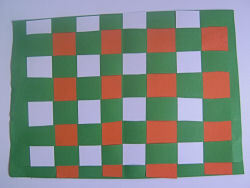 Cut the paper into strips about 1 inch wide. Take a strip of paper and pass it under the card and then up through the first slit, down through the second and back up through the third and so on until you reach the other side of the card. Push it up so it sits as close to the top of the red card as it can reach. Repeat with a different coloured strip of paper, starting the other way, down through the first slit and up through the second and so on. Repeat until the card is full. Laminating will protect your mat.